…A recent article in the D&C Real Estate section explored a Brighton home that owners spent $30,000 to “renovate” while prepping to sell. In the article they discussed painting, removing worn carpet and refinishing hardwood floors. Those moves make good sense because they freshen without destroying original details. 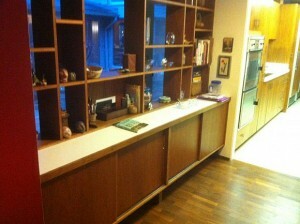 But the family also painted their fireplace and original 1950s wood cabinets in the kitchen. These decisions can turn off a buyer looking for an original 50s style and do not hide the fact that the house and cabinets are 60 years old. In my home, a previous owner actually chopped off part of the fireplace hearth to make room for a piece of furniture.